"Proper ladies can do whatever they want!?" her time at home in a track suit. the heiress to the parent company's Misono family!? but you just can't manage to get used to your glamorous lifestyle! hot and cold fiancé, and ditzy cousin! 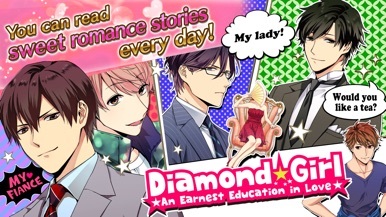 This is perfect for girls who want to enjoy an otome game free of charge! ●Here are the handsome guys you can choose from! You can choose whichever guy you prefer. ●Diamond Girl is this kind of app! living in a beautiful estate surround by handsome men. 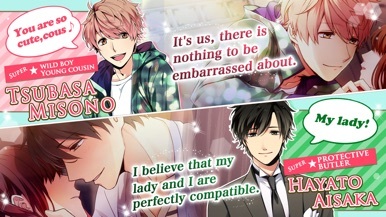 "love-allergic" heroine who wears track suits around and the handsome men. you suddenly go from friend to boyfriend. surrounded by handsome men after a life of unexcitement. 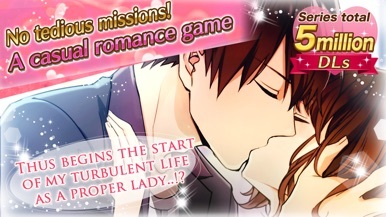 such as dating a butler, cocky boy, younger guy, or mean but loving boyfriend! romance to one in which every day is filled with excitement and happiness. comfortable with dating experiences the transformation from friend to boyfriend. -You can enjoy the excitement of marrying the man of your dreams! -See that cocky boyfriend get smitten! Behind that cockiness is kindness. -See that cold boyfriend get smitten! He's a bashful guy. -The awkward communication of a servant! Love starts with friendship! -A strict boss at work, but a cute, kind guy behind the scenes! watch as feelings blossom and you experience an exciting love! Voltage MAX! -People looking for not only romance, but a comical novel in a dating simulation game. -People searching for a romance drama application where one can experience a love drama. -People searching for a reverse harem game as seen in otome love dramas, comics, manga, anime, and novels. -People searching for a romance drama application you can play free of charge. -People who like the words cool, mysterious, charismatic, and glamorous. -People who want to enjoy a girls' game for adults filled with destined love fall from the realm of reality. -People who want to read a love story filled with kisses from your beloved boyfriend. -Women looking for a SLG game with office romances. -This game will not work offline. Make sure you have an internet connection when you play. -Update your device's software to version 8.0 or later to play.